Marketing Automation used to be the ace of bigger names in the E-Commerce world. However, 2018 was a turning point for marketing automation for smaller business. Now, even smaller businesses can have access to this innovative marketing approach. Read on to see our 10 inspirational graphics about marketing automation for E-commerce, along with essential facts that you need to know about this process. We believe you’ll be convinced to use the services after seeing these graphics. Marketing Automation is a series of services that enable e-commerce business to automate the marketing and sales tasks. It could be profiling customers on landing pages. It could score the leads, or send automated personalized emails. 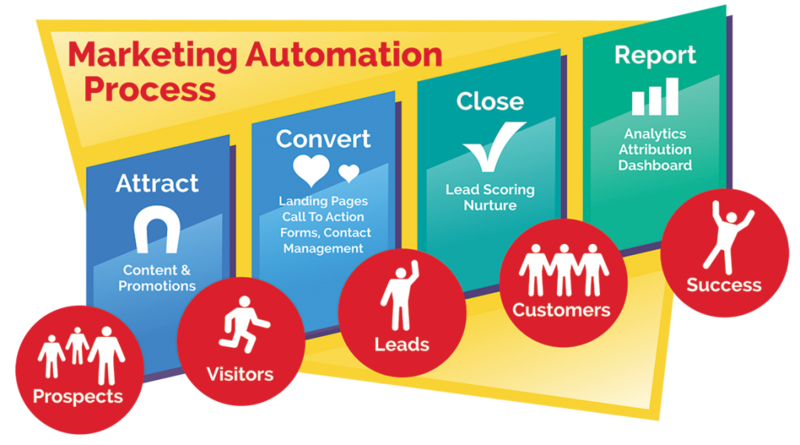 Marketing automation can also nurture leads and engage customers. The biggest obstacle that keeps smaller businesses from access to Marketing Automation is the expense, as stated by a study. Only 10% of small E-commerce has invested in marketing automation. One of the most common forms of marketing automation is emailing. As a mean of nurturing leads, the bots automatically create different mail list. The auto-responders can tailor their communication to each lead. Auto mail is also one of the foundations of any marketing automation system. Compared to traditional marketing, Marketing Automation allows E-commerce to provide better personalized, more responsive funnels to customers, without costly human workforces. Marketing automation sets out “bots” that will follow a lead in the sales process. From when the lead clicks on the link and gets to the landing page until the lead has converted or became lukewarm, this bot can follow and act suitably. Marketing Automation shows its capacity well in responding to customer care. It also applies to landing pages and answering customer inquiries regarding information of products. Not only can it promptly give the leads the exact information they need, but it can also nurture these leads through emailing, texting. In the meantime, the system can notify a sales rep to make a real human connection to the customer. On the market, there now exists many platforms for marketing automation. The most well-known including Linked-In, Hub Spot and Google Adwords. Each of these platforms is typically used alongside with other SAAS or CRM tools. There are many factors regarding choosing a marketing automation platform. The best one for your E-commerce should be decided based on your goals of conversion rate or hot leads. Marketing Automation simplifies many sales and marketing process. From collected data, they can profile leads effectively. These leads then will be profiled in different segmentation, and assigned to may workflows accordingly. Without a doubt, marketing automation is a tool that will bring significant benefit and cut good cost for your E-commerce. Using these reinforcements effectively can bring countless benefits to the business. While many startups remain clueless about marketing automation, we hope that these 10 inspirational graphics have somehow shown you a better picture of it.